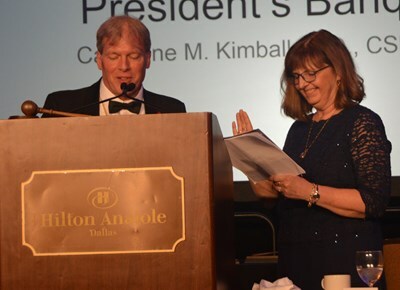 Catherine M. Kimball, DO, of Waterville, Maine, was inaugurated as the 2018-19 president of the American Academy of Osteopathy (AAO) on March 24 during the academy’s annual Convocation in Dallas. Before becoming president, Dr. Kimball served for one year as the president-elect of the AAO, the nation’s largest medical society devoted to fostering neuromusculoskeletal medicine and osteopathic manipulative medicine. Dr. Kimball has been in private practice in Waterville, Maine, for more than 30 years. In addition to her family medicine practice, she provides osteopathic manipulative medicine consultation for a wide range of problems including headache, newborn feeding difficulties, ear infections and back pain. As a leader in osteopathic medicine, Dr. Kimball is especially passionate about encouraging osteopathic and allopathic physicians (DOs and MDs) to incorporate hands-on diagnosis and treatment in their practices. Dr. Kimball has served as chief of staff for Inland Hospital since 2012. She previously served as chief of staff from 1993 to 1999 and from 2001 to 2007. She also has served on Inland Hospital’s Board of Trustees for many years, and she has served on various committees, including the Joint Conference Committee (1994-present), the Inland Foundation Board (2001-04), the Osteopathic Manipulative Concepts Committee (1987-97) and the Personnel Committee (1990-97). In addition, Dr. Kimball was actively engaged in Eastern Maine Healthcare Systems’ Leadership Reinvented initiative, which focuses on streamlining processes to increase care and efficiency. In 1985, Dr. Kimball graduated from the Kirksville College of Osteopathic Medicine in Missouri (now part of A. T. Still University), and she completed a general internship and residency at Waterville Osteopathic Hospital (now Inland Hospital). She is board certified in osteopathic manipulative medicine and in family practice. Dr. Kimball has been active in the osteopathic profession both locally and nationally. She is a member of the American Osteopathic Association, the Osteopathic Cranial Academy, and the Maine Osteopathic Association in addition to the AAO. She has served on the AAO’s Board of Governors and Board of Trustees, and she previously served on the American Osteopathic Board of Neuromusculoskeletal Medicine.Catherine M. Kimball, DO, of Waterville, Maine, was inaugurated as the 2018-19 president of the American Academy of Osteopathy (AAO) on March 24 during the academy’s annual Convocation in Dallas. Before becoming president, Dr. Kimball served for one year as the president-elect of the AAO, the nation’s largest medical society devoted to fostering neuromusculoskeletal medicine and osteopathic manipulative medicine. Dr. Kimball has been active in the osteopathic profession both locally and nationally. She is a member of the American Osteopathic Association, the Osteopathic Cranial Academy, and the Maine Osteopathic Association in addition to the AAO. She has served on the AAO’s Board of Governors and Board of Trustees, and she previously served on the American Osteopathic Board of Neuromusculoskeletal Medicine. For additional information, contact AAO Executive Director Sherri L. Quarles at SQuarles@academyofosteopathy.org.